This book is an elementary introduction to geometric topology and its applications to chemistry, molecular biology, and cosmology. It does not assume any mathematical or scientific background, sophistication, or even motivation to study mathematics. It is meant to be fun and engaging while drawing students in to learn about fundamental topological and geometric ideas. Though the book can be read and enjoyed by nonmathematicians, college students, or even eager high school students, it is intended to be used as an undergraduate textbook. The book is divided into three parts corresponding to the three areas referred to in the title. Part 1 develops techniques that enable two- and three-dimensional creatures to visualize possible shapes for their universe and to use topological and geometric properties to distinguish one such space from another. Part 2 is an introduction to knot theory with an emphasis on invariants. Part 3 presents applications of topology and geometry to molecular symmetries, DNA, and proteins. Each chapter ends with exercises that allow for better understanding of the material. The style of the book is informal and lively. Though all of the definitions and theorems are explicitly stated, they are given in an intuitive rather than a rigorous form, with several hundreds of figures illustrating the exposition. This allows students to develop intuition about topology and geometry without getting bogged down in technical details. 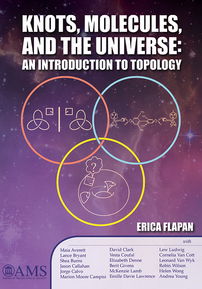 Undergraduate students and instructors interested in elementary topology. [T]his is a wonderful introduction to geometry and topology and their applications to the sciences. The book contains a unique collection of topics that might entice young readers to continue their academic careers by learning more about the world of mathematics.